I have to recognize that I have never tried any skincare or makeup product from any korean brand until I didn't get this LANEIGE Water Bank Moisture Cream (for normal to dry skin) from Influenster free/complimentary for testing purposes. First of all, let me tel you, when I opened the box and saw this beautiful and sophisticated blue packaging I felt like I was somewhere near the ocean. It was absolutely adorable. 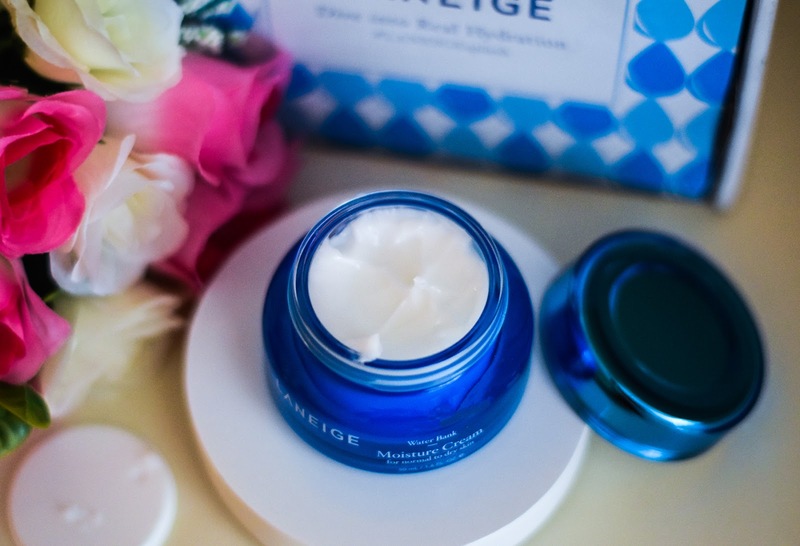 This is a lightweight moisturizer, that is "formulated LANEIGE's patented Hydro Ionized Mineral Water, to help replenish and retain ideal hydration levels, preventing future moisture loss. The cream is richy texturized for instant absorption. It relieves dryness and leaves skin hydrated and glowing." And now my experience: I've been using this moisturizer only last few days twice a day and I can already see the difference in my complexion: let me remind you that my skin is dry and sensitive, time to time becomes extremely dehydrated. This LANEIGE Water Bank Moisture Cream made it very smooth and hydrated. What I like the most is that it quickly absorbs into the skin and has no greasy feeling. This LANEIGE moisturizer is mildy scented but love how lovely it smells and the main thing is that even though it contains fragrance, it doesn't irritate my sensitive skin. I like that this mosturizer is cruelty-free, and is not tested on animals. This reminds me Estee Lauder Verite Moisture Relief Cream (you can read my review here: Estee Lauder Verite Moisture Relief Cream review) but LANEIGE one keeps my skin hydrated longer that Estee Lauder one. If you looking for a new lightweight fast-absorbing moisturizer for your normal or dry skin, you should check this crem out. It just hit Sephora's shelves. 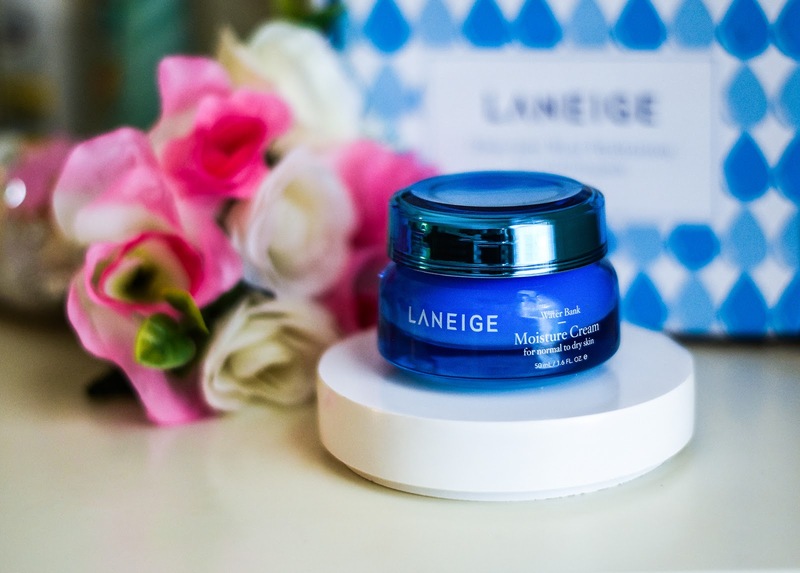 * This LANEIGE moisturizer was sent to me free/complimentary from Influenster for testing purposes but the review you just read represents my own opinion based on my own experience. There is nothing more important than be true to myself and be sincere with all of you, beauties. I've never heard of this product before. Looks like something I'm going to have to try! I hope you will like it too, Shireen. The packaging does look great. I'll be heading to Sephora later today so I'll check it out. Thx Nina! I love korean products. So glad you are trying a korean brand. The texture seems amazing. I'm glad , I gave this cream a try, it's so lovely. Need to try this! I love Korean products! Laneige is seriously one of my favorite lines and I have this cream on my rotation too! sounds really nice!! love korean things. This product sounds so nice! It mush be a great cream! Thanks for sharing! Pretty packaging, is this tested on animals? I'm glad that this cream is cruelty-free, and is not tested on animals. That sounds great! I always need to use moisturizing products since I live in the desert. I think are great product! i love la neige products ! I tried a lot of their products and i was never disappointed by any of them ! I am glad that this one worked for you. I have extremely oily skin so this one might be too much for me. I've never heard of this, but it sounds promising! This sounds like such a great moisturizer for dry skin! My skin is combination/oily, so I'm not sure if it would provide too much moisture for me. Thanks so much for sharing your thoughts with us, girlie, and I hope you're having a great start to your week so far!